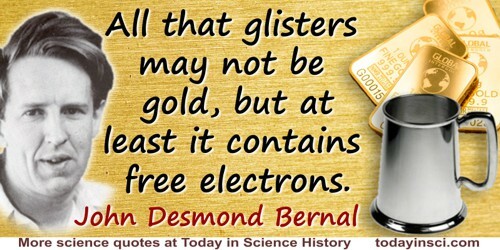 All that glisters may not be gold, but at least it contains free electrons. But it is necessary to insist more strongly than usual that what I am putting before you is a model—the Bohr model atom—because later I shall take you to a profounder level of representation in which the electron instead of being confined to a particular locality is distributed in a sort of probability haze all over the atom. 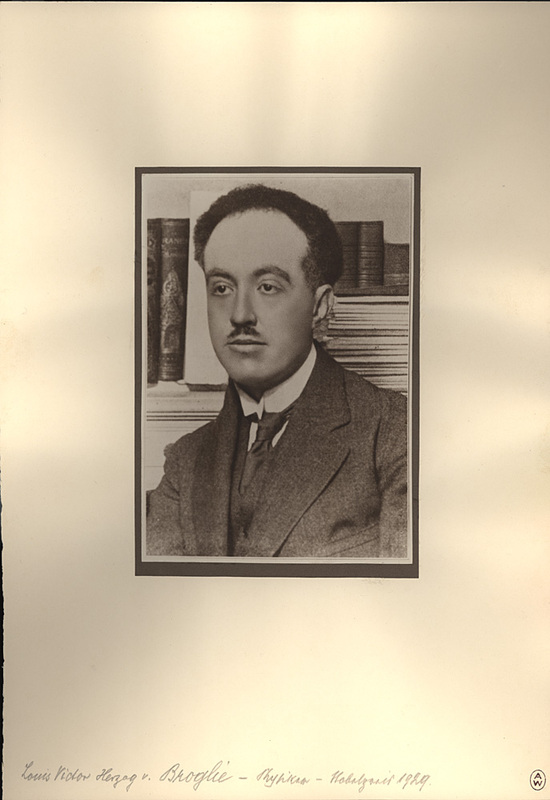 Messenger Lectures (1934), New Pathways in Science (1935), 34. 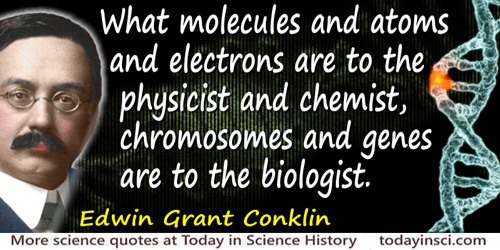 I am glad that Dr. Chadwick has stuck to the view that it [the neutron] is a combination of a proton and electron. Some people have said it was a new kind of ultimate particle. It was really too much to believe—that a new ultimate particle should exist with its mass so conveniently close to that of the proton and electron combined. It was nothing but a bad joke played on its creator and on the rest of us. Still, there is no doubt this neutron business is going to have many developments. 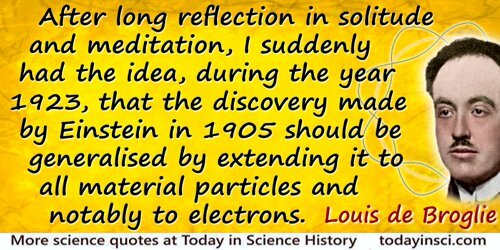 As reported in article on the York Meeting of the British Association for the Advancement of Science by Ferdinand Kuhn Jr., 'Finds Two Particles Make Up Neutrons', New York Times (6 Sep 1932), 12.
protons in the universe, and the same number of electrons. From Tarner Lecture (1938), 'The Physical Universe', in The Philosophy of Physical Science (1939, 2012), 170. Note: the number is 136 x 2256. 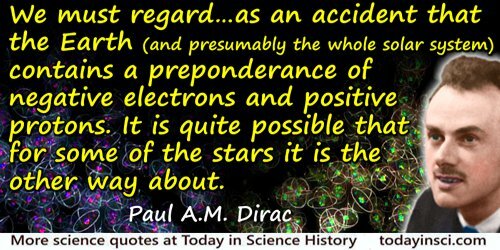 Quoted in George Wald, 'The Origin of Optical Activity', Annals of the New York Academy of Sciences (1957), 60, 352-68. If I say [electrons] behave like particles I give the wrong impression; also if I say they behave like waves. They behave in their own inimitable way, which technically could be called a quantum mechanical way. They behave in a way that is like nothing that you have seen before. In recent years several new particles have been discovered which are currently assumed to be “elementary,” that is, essentially structureless. The probability that all such particles should be really elementary becomes less and less as their number increases. It is by no means certain that nucleons, mesons, electrons, neutrinos are all elementary particles. Opening statement, Enrico Fermi and C.N. Yang, 'Are Mesons Elementary Particles? ', Physical Review (1949), 76, 1739. As cited in James Gleick, Genius: The Life and Science of Richard Feynman (1992), 283. Life is a partial, continuous, progressive, multiform and conditionally interactive, self-realization of the potentialities of atomic electron states. In The Origin of Life (1967). Strong, deeply rooted desire is the starting point of all achievement. 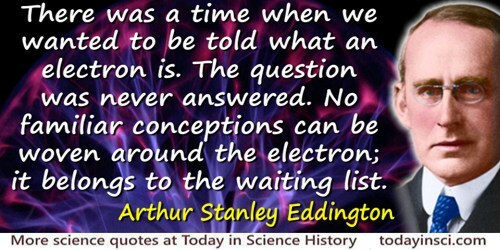 Just as the electron is the last unit of matter discernible to the scientist. DESIRE is the seed of all achievement; the starting place, back of which there is nothing, or at least there is nothing of which we have any knowledge. The electron is not as simple as it looks. 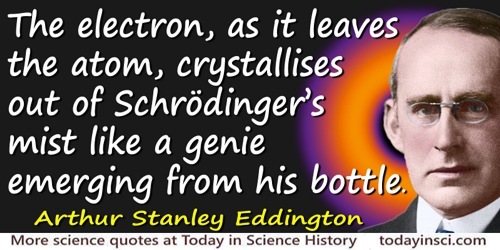 The electron, as it leaves the atom, crystallises out of Schrödinger’s mist like a genie emerging from his bottle. Gifford Lectures (1927), The Nature of the Physical World (1928), 199. The sun atom shakes; my eye electron shakes eight minutes later, because of a direct interaction across. 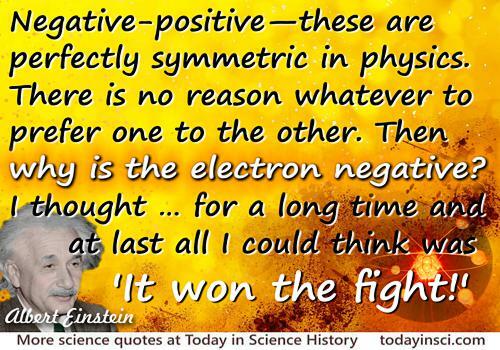 In his Nobel Prize Lecture (11 Dec 1965), 'The Development of the Space-Time View of Quantum Electrodynamics'. 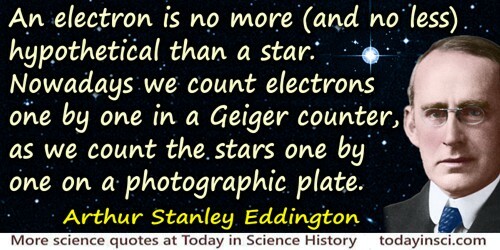 Collected in Stig Lundqvist, Nobel Lectures: Physics, 1963-1970 (1998), 156. To the electron—may it never be of any use to anyone. In Michael Riordan and Lillian Hoddeson, Crystal Fire. In Marc J. Madou, Fundamentals of Microfabrication: the Science of Miniaturization (2nd ed., 2002), 615.